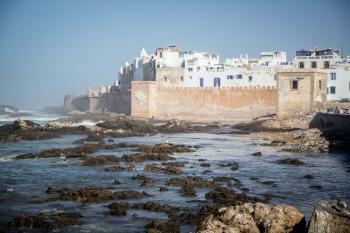 The Medina of Essaouira (formerly "Mogador") is an example of a late 18th century fortified town, as transferred to North Africa. Sultan Sidi Mohamed ben Abdellah decided to build a port that would open Morocco up to the outside world and assist in developing commercial relations with Europe. He hired a French architect (Nicholas Théodore Cornut) who had been profoundly influenced by the work of Vauban at Saint-Malo. 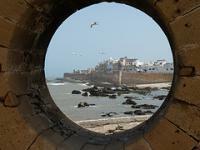 Essaouira is a lovely little place and an easy side trip from busy Marrakech. Although it's the medina that is the main focus of the WHS, there are more things to when you're there. In the warmer months, the beach is a great place. My favourite area was the port, full of blue boats and blue nets - it's really picturesque. There are some nice riads for accommodation in the medina and some interesting little side streets once you get away from the main boulevard. Well worth the trip, even if it wasn't a WHS. Travelling by bus from Marrakesh to Essaioura past endless olive groves was my introduction to the Moroccan countryside. It was the harvest season, so they were a hive of activity. The Medina of Essaioura was compact and enclosed by stout walls. 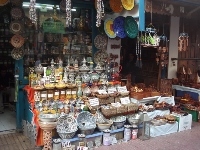 Within, the souqs were more laid back than in Marrakesh, and especially colourful in the collonaded parts. The fortified port also held a lot of interest, especially the seafood grill restaurants. I visited this WHS in June 2011. 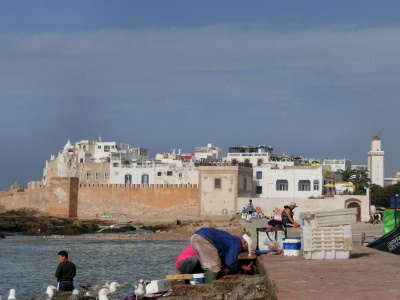 The highlight of this Medina for me were the walls surrounding it and the Mogador islets in the Atlantic Ocean. Great picturesque views from the Fort. A very colourful, artistic and historical town.Here one can enjoy culture and climate at the same time.I was there in Nov 2011 and the weather was fine. Enjoyed the market. A negative comment is that a bit of hygienne would be appreciated at the fish market a good clean public convenience is an assest. I had heard lots of great stories about Essaouira, so thought it would be worth the trip down from Marrakesh, and as it turned out it was well worth the effort to get there. The central souqs are laid out in a grid, making them easier to navigate than many other medinas. This is due to the site being planned as a European style city on the African Coast. It was based on St Malo in northern France (worth a visit if you are near Mt St Michel), which is a much grander and perhaps better-preserved city, and many aspects of the two cities are the same, especially the sea facing ramparts (picture). 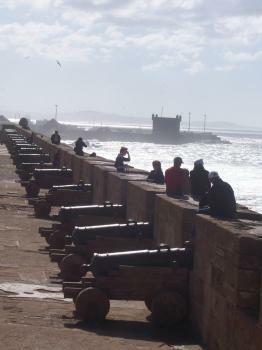 This was my favourite part of Essaouira, it was very windy but was a great place to relax and have some lunch. I must admit to being a little under whelmed when I first arrived, with the city centre not really being anything too interesting. However the ramparts did add something more. In regards to its merits for inscription, I know ICOMOS dragged their feet in regards, and I can understand why, it is not as impressive or as well preserved as St Malo. However it being a European planned city in Africa makes it important and it was a destination for much of the goods from the Saharan hinterland en-route to the European Market. I had good fun battering for Berber and Dogon goods in the souqs so I can attest to the fact that the goods still get through. Even if I am a little suspicious of its place on the list, it is a really great place to visit, especially if you want to relax after hectic moments in Marrakesh's souqs. Prison: "The prison, located on the offshore island"
Mosque: "The many mosques, in a characteristic style, and especially the Mosques of the Casbah and Ben Yossef." Cultural sites taking up an entire island: Ile d'Essouaria containing the prison - offshore from the Medina.